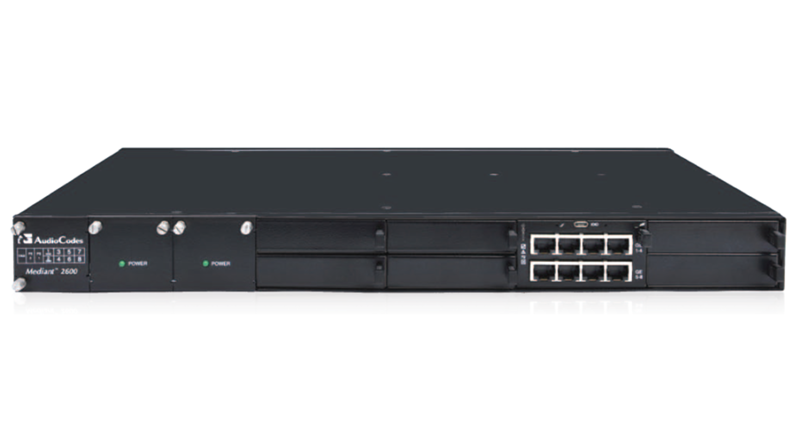 AudioCodes Mediant 2600 Enterprise Session Border Controller (E-SBC) is a medium capacity device for VoIP deployments of up to 600 concurrent sessions, supporting extensive SIP connectivity with wide-ranging interoperability, enhanced perimeter defense and advanced voice quality monitoring. The Mediant 2600 Enterprise Session Border Controller (E-SBC) offers SIP protocol mediation enabling the connection of any IP-PBX to any SIP trunking service provider; advanced quality-of-experience (QoE) monitoring; and perimeter defense as a way of protecting enterprises from malicious VoIP attacks. Designed for medium-sized deployments with high performance demands, the Mediant 2600 E-SBC scales up to 600 concurrent SBC VoIP sessions.